The firm building HS2 has named the consortia that will be awarded contracts to deliver the project’s London terminus and west London ‘super-hub’. 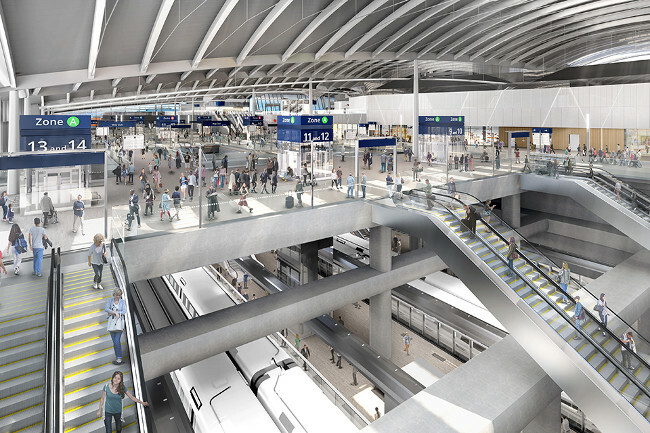 HS2 Ltd said it intends to appoint a joint venture comprising Mace Ltd and Dragados S.A. for works at Euston and a JV of Balfour Beatty Group, VINCI Construction UK Ltd, VINCI Construction Grands Projets SAS and SYSTRA Ltd for the new station at Old Oak Common. A spokesperson for the Government-owned firm said current estimates for the works were £1.3bn for Euston and £1bn for Old Oak common but stressed that these are subject to change as plans develop. The ‘construction partners’ for the stations will be responsible for working with HS2 Ltd and the station designers to co-ordinate the delivery of the stations, including platforms, concourse and links to the London Underground and other rail services. The announcement follows the release of the latest design images for Old Oak Common (above), where HS2 will eventually meet the still unfinished Crossrail line. HS2 Ltd said the station is set to be ‘the UK’s best connected rail interchange’, with an estimated 250,000 people passing through every day. Its chief executive, Mark Thurston, said: ‘Euston and Old Oak Common are two of the most important elements of the project - two landmark stations which will help unlock tens of thousands of jobs and new homes across the capital. Together with our Birmingham stations, they will transform the way we travel and set new standards for design, construction and operation. Jason Millett, Mace's chief operating officer, said: ‘HS2 will transform Euston, delivering much-needed extra capacity and better journeys for the 44 million people that use the station every year. Concerns have been growing that the £56bn project is falling behind and going over budget. The 2017 contract notice, which estimated the cost of the projects at £1.65m for Euston and £1.3m for Old Oak Common, stated that the contracts were expected to start in September 2018. The HS2 Ltd spokesperson said that subsequent work on the scope and design of the projects had led to greater certainty around the current estimated budget. The firm said work is already well underway on the overall project, with more than 7,000 jobs already supported, both directly and across the UK-wide supply chain. In London, more than a thousand people are at work on site, clearing the way for the start of construction and delivering essential pre-construction works, including a ‘pioneering’ archaeological programme, the firm said.